I just love the fall decorations all around the my neighbourhood! I just had to share this one. I call it "Fall on Oak Street"
Have a safe Halloween! Boo! Off to Market I go .... day 2! Today was schoolhouse .... what a day! My morning ritual is to pick the sessions I think will be of interest. So much to choose from! Did get this stinking cute bag from Riley Blake! If you spent so much, you got the bag ... well I made sure I spent so much! You understand right? 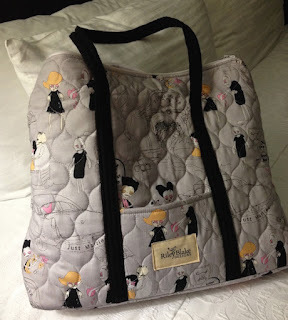 They also had these cute smaller bags you could purchase! So now I'm styling! Of course I had to get me some Zombie Love - 1 yard cut! I must admit, it's the first time I spend so little at Sample Spree! I really wanted to buy but couldn't find anything .... Maybe I should call my doctor? Off to process my day! Thanks for stopping by! Cheers! Off to Market I go ....! Arrived in Houston early Thursday morning. Goodness it's hot and humid! Didn't do much except walk around a bit and stopped at my favourite Mexican restaurant - Guadalaja Del Centro - and had one of these. It's official ... I am now in International Quilt Market Mode! Cheers! And the beat goes on .....! Wow, I cannot believe I haven't posted in a month. Where has time gone? I kid you not, yesterday I lost an hour somewhere. Has anyone seen it? I had plans to attend the local guild meeting at 6:00 p.m. Closed shop at what I thought was 5:00 p.m. Hopped in my car, drive out of the parking lot, checked the clock and it was 6:15 p.m. What the heck???? Pointless driving down, I'll miss half the meeting! Anyway, last weekend I vended for the very first time. Never having done this before, I did not accurately calculate the amount of time it would take me to prep everything. There were many late evenings, attempting to look organized. Lesson learned! I had no idea that my booth was going to be this large! What a fun experience it was for me, met some wonderful quilters. On the quilting front, I machine quilted Fivrol 1 - Kindred by Bonnie & Camille. Love how it turned out! This is such a happy quilt ... Hello Darling! 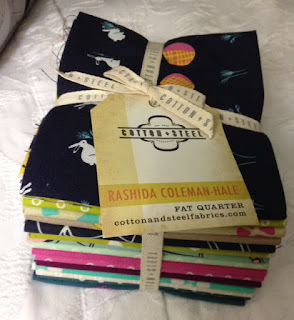 such a happy fabric line! 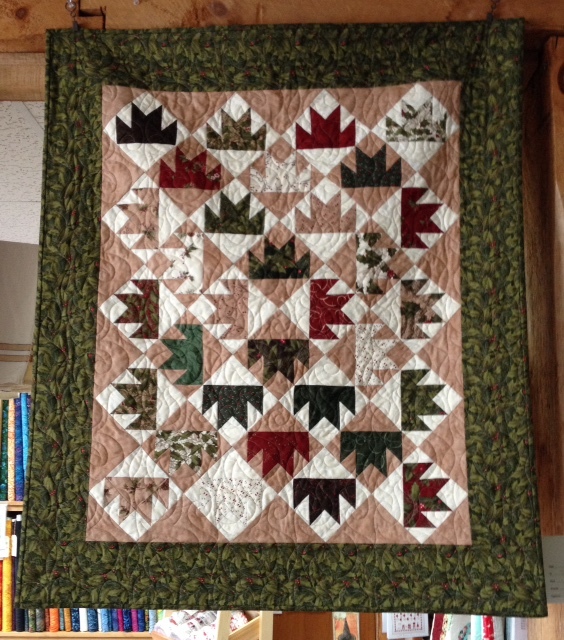 I also finished this little quilt using Holly Taylor's latest line - Winter Song. The pattern is called OSO by Carrie Nelson. 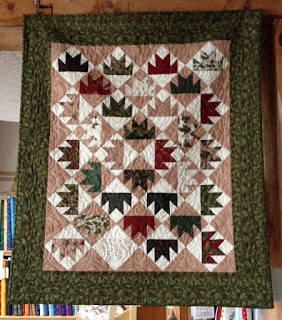 I used one charm pack for the center blocks and yardage for the rest. I call this quilt, Bear Tracks through the Woods. Carrie's instructions is to use two charm packs and create a scrappy border, but I chose to use yardage. So, what have you been up to? Thanks for stopping by! Cheers!